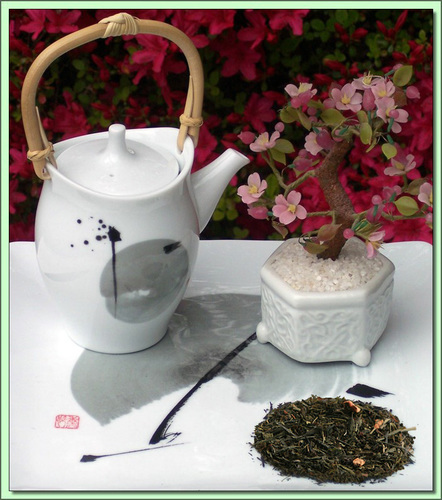 Character: Exceptional Japanese Sencha enhanced with notes of orchard fresh Granny Smith apple. Sweet, smooth finish. What do you get when you blend apples with a Hi-Antiox Kenyan Green Dryer Mouth tea? In addition to a refreshingly brisk cup of tea, the antioxidant goodness of two of Mother Nature's greatest creations. Hi-Antiox Pommes Green delivers an antioxidant boost combined with delicate notes of grass, freshly cut apples and sweet astringent layers - a superb, any-time-of-day sipper! The teas used to create this blend: Kosabei: this estate produces some of Kenya's finest teas. Certified by the Ethical Tea Partnership and Fair Trade. Ingredients: Luxury green tea, Natural dried apple, Natural flavors. Hot Tea: This tea is best enjoyed by pouring 180F/90C water over the leaves (1-1 1/2 teaspoons) for 3 minutes (longer=stronger). Don't remove the leaves. Infuse repeatedly 2-3 times using higher temperatures & shorter infusions until flavor is exhausted.